Exploring new foods is richly rewarding — and even more enjoyable when you know how to use new ingredients, how much of each to buy, and how to incorporate them into a meal. This convenient pocket guide demystifies that process of discovery by packing the knowledgeable information of Margaret M. Wittenberg's NEW GOOD FOOD, the definitive guide to natural foods, into a concise, easy-to-carry format. Plenty of easy-reference entries help you navigate your many options when choosing organic, local, sustainable, and ethical foods. 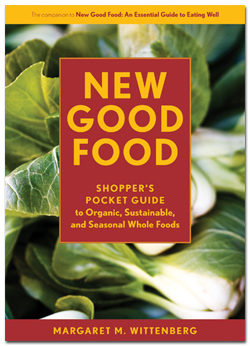 With handy charts and tables that summarize what's in season when, and ingredient-specific guides to buying, storing, and preparing the bounty of whole foods now widely available, the NEW GOOD FOOD SHOPPER'S POCKET GUIDE helps you make choices that sit your principles, your palate, and your pocketbook.